Hot on the heels of last month's release of the 25th Anniversary Edition DVDs/Blurays of the beloved trilogy, gaming publisher Telltale Games is releasing Back to the Future: The Game. 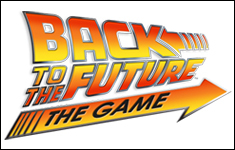 The game, played in five episodes that will be released over time, continues the story of time traveler Dr. Emmett Brown and his teenage sidekick Marty McFly, iconically played in the movies by Christopher Lloyd and Michael J. Fox, respectively. It all starts six months after the end of the Wild West-themed Back to the Future: Part III when the DeLorean shows up in 1986 with a message from Doc. Lloyd returns as the voice of Doc, and newcomer AJ Locascio does a pretty great job (it seems) of recreating MJF's Marty. Check out the Behind the Scenes videos below, including an adorable clip of Locascio expressing his incredible excitement over being able to deliver the line, "What the hell is a jigawatt?!" Behind the Scenes, Part 2: Hey McFly!